Home > Pellets > Harrison's Adult Lifetime Mash 1lb. 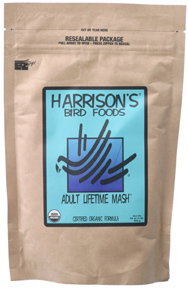 Harrison's Adult Lifetime Mash for small birds, that meets the nutritional requirements (after a 6 month period on High Potency) for non-breeding, non-molting birds including canaries, budgies, cockatiels, doves, lovebirds, conures, pigeons and other small birds. This formula does not contain peanuts, sunflower and corn. Ingredients: *Hulled Grey Millet, *Ground Hulled Wild Buckwheat, *Ground Soy Flakes, *Ground Hulled Sesame Seeds, *Chia Seed, *Ground Alfalfa, Calcium Carbonate, Montmorillonite Clay, Monocalcium Phosphate, *Ground Dried Sea Kelp, Vitamin E Supplement, Sea Salt, *Ground Whole Anise, *Algae Meal, Vitamin A Supplement, Vitamin D3 Supplement, D-alpha Tocopheryl acetate, Vitamin B12 Supplement, Riboflavin Supplement, d-Calcium Pantothenate, Niacin Supplement, Pyridoxine Hydrochloride, d-Biotin, Thiamine Mononitrate, Folic Acid, Zinc Oxide, Copper Sulfate, Sodium Selenite, Calcium Carbonate. Guaranteed Analysis: Crude Protein min 17%, Crude Fiber max 8%, Crude Fat min 6.5%. Harrison's Pepper Lifetime Course 5lb. Harrison's Adult Lifetime Course 5lb.